The forums are a great source of information, and some of the users provide genuine gems of advice for all who care. So go check out the SOLIDWORKS Forums. All can read, but you need to log in to participate. “Mates have been reversed” – Can I turn it off? So go explore the forums. If you find other good tips and tricks, let us know so we can feature them here in this blog. The length of the element is much greater than the width or depth. The element has constant cross-sectional properties. They don’t tell you, however, when NOT to use beam elements. That’s precisely what I’m going to do . 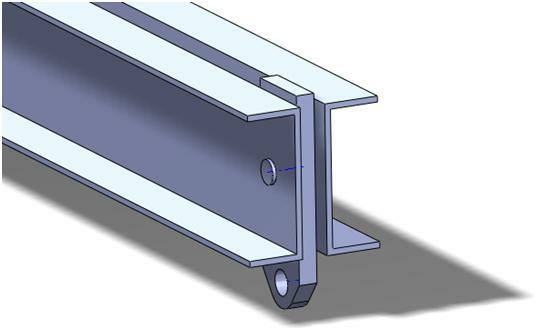 Although SOLIDWORKS Simulation automatically treats as Beams all the Structural Members in your model, this absolutely doesn’t mean that you have to blindly accept this default setting. Using beam elements to represent a solid geometry has drastic consequences on the representation of the actual structure, the mesh and results: extreme simplification of geometry, different types of stress outputs, connections with other components. Choosing the appropriate type of element to represent a body requires an engineering sense only humans can have. Don’t let the machine do it for you! As a matter of fact, when a solid is treated as a beam, the actual geometry is completely inaccessible to the simulation, and it is replaced with a simple line (straight or curved depending on the case). Therefore, each cross section of the beam is represented by a single point on that line. A set of values (called section properties) represent the mechanical properties of the cross section. They give the beam mesh a behavior that is equivalent to that of the solid mesh taken as a whole. In the image below, the vertical I beam should not be treated as a Beam if it is important to take into account the triangular stiffeners. 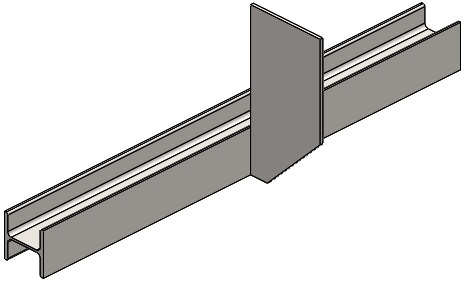 In the image below, the horizontal C channels should not be treated as Beams since it would then be impossible to represent the connection with the pin. 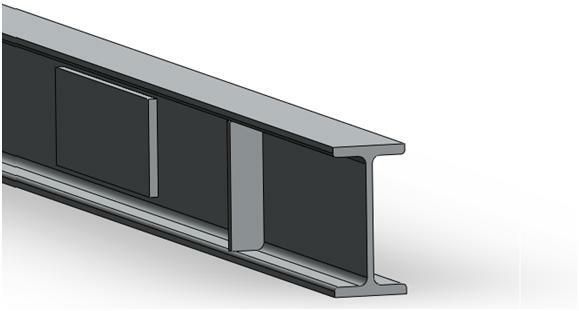 In the image below, the I beam should not be treated as a Beam if it is important to take into account either the superimposed rectangular flat plate or the other stiffener. In the image below, the I beam should not be treated as a Beam. 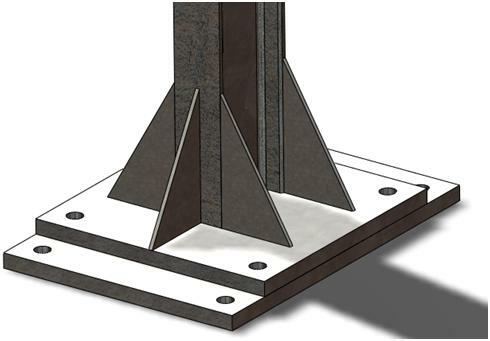 The bonded connection of the plate onto the flange of the I beam cannot be accurately represented if a beam mesh is used.. The SOLIDWORKS 2017 Beta has ended. We want to thank you all for your participation and your precious feedback. Check out the leader board with the most productive users and VARs of the contest. Last month, Ramesh started on the topic of Bolt Connectors. He now concludes on that topic with the third and final part. Next month, Ramesh will move on to Pin Connectors. Download the hotfix from Solution Id: S-071869. See also the General Hotfixes page. When I double-click on an individual ‘Sheet-Metal’ feature, why am I not able to see the bend radius, thickness and K-factor values in the graphics area? All sheet metal part bodies inherit the bend radius and thickness values from the sheet metal parent folder. For this reason, the bend radius, thickness, and K-factor values for an individual ‘Sheet-Metal’ feature do not appear in the graphics area unless you select the ‘Override default parameters’ option in the individual ‘Sheet-Metal’ features. What do I need to know about problems that are specific to the SOLIDWORKS® PDM 2016 SP4 software? – SPR#972893: Database Server Service fails to generate Notifications and Custom Columns are not shown using PDM Standard 2016 SP4. This problem prevents the automatic generation of notifications. It also prevents the display of custom columns. – SPR#973673: Export Rule for BOM data does not output XML file in SOLIDWORKS PDM Professional 2016 SP4. This problem prevents the export and import of XML data. These problems do not exist in SOLIDWORKS PDM 2016 SP3 or in older service packs of the SOLIDWORKS PDM 2016 software. A hotfix is now available to correct these problems. Please download the hotfix (SWPDM2016SP4_SPR973673_972893_Hotfix.zip) attached to Solution Id: S-071775 and follow the instructions in “Instructions.txt” which is included in the zip file. In the SOLIDWORKS® PDM software, how do I prevent a client from automatically logging in to a vault view or from displaying the login dialog when creating a new e-mail message in the Microsoft® Outlook 2016 software? In the Microsoft® Outlook 2016 software, the default action of the ‘Attach File’ button is to list files that were recently saved or worked with. This is a new feature in Outlook 2016. If the list contains files from one or more of your local file vault views and you are not currently logged in to that view, a login prompt appears when you create a new message. Outlook triggers the login prompt when the list of items populate the attach file button and the folders in the view are scanned for the file name. If you do not want to log in to the file vault view, you can cancel the login prompt and proceed to create the new message. However, if you do not want Outlook to prompt for login, or to log you in to the view automatically if that setting is active, you can disable that behavior. For instructions, read the document in Solution Id: S-071660.